Dr. Hermann Müller, born in the northern Swiss canton of Thurgau, created the variety in 1882, hoping to combine the nuances and flavors of Riesling with the early-ripening characteristics of Silvaner (itself an old hybrid of Traminer and Österreichisch Weiss). But according to recent DNA profiling, the Companion notes, Müller-Thurgau is actually a cross of Riesling and Madeleine Royale, a simple table grape (a grape intended to be eaten as fruit). Whoops. The Companion agrees about Alto Adige, and also cites Oregon as promising Müller-Thurgau territory. A bottle of 2009 Montinore Estate Müller-Thurgau I found from Oregon’s Willamette Valley didn’t quite reach the lofty heights of the Kofererhof, but it certainly rose above German sugarwater. This Müller-Thurgau smelled to me like very ripe pears. On the tongue, for a moment it just tasted like apple juice. Uh-oh. But then I felt the prickle of some acids, and the wine pulled itself together with a satisfyingly tart finish. It wasn’t the “revelation” that the Kofererhof had been for Gaiter and Brecher, but certainly I enjoyed drinking it. Paired with a spring risotto with peas, asparagus and baby artichokes, the acids became even more prominent, cutting through the richness of the dish. I love to see serious wineries like Montinore experimenting with this oddly named variety with a bad reputation. We wine drinkers stand to gain much from their risk-taking. Müller-Thurgau may not flourish in Germany, but if you see one from Oregon or Italy, grab it. Your sommelier might look askance, but you’ll know better. 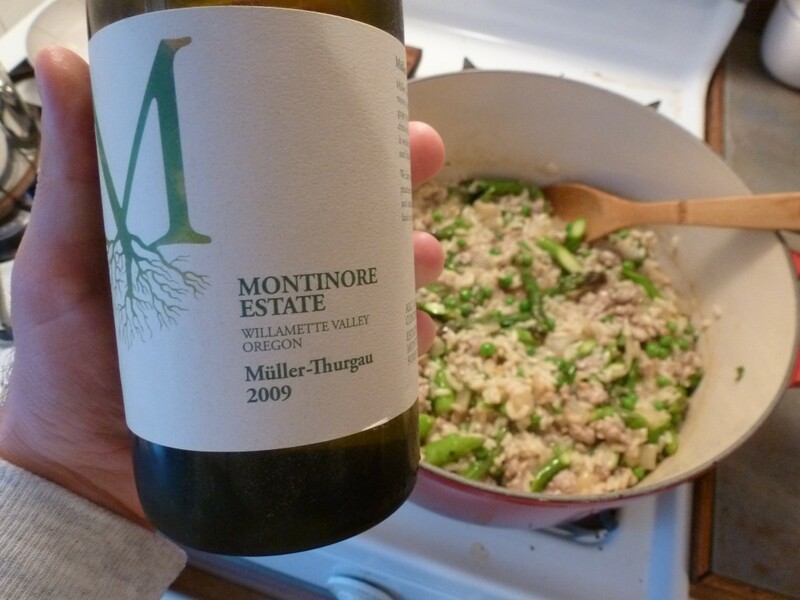 2009 Montinore Estate Müller-Thurgau: Starts sweet, but the sugars are balanced by food-friendly acids. A fine pairing with risotto, pastas with cream-based sauces or lightly spicy Asian dishes. Serve well-chilled. Find It: I purchased this bottle for $12 at In Fine Spirits, which isn’t carrying the wine as of this writing. The Montinore website offers the 2011 vintage for sale for $16.